German Protestant theologian; born at Magdeburg Jan. 22, 1830; died at Jena Jan. 9, 1903. In 1875 he became professor of theology at the University of Jena, and in 1892 received the title of "Geheimer-Kirchenrat." 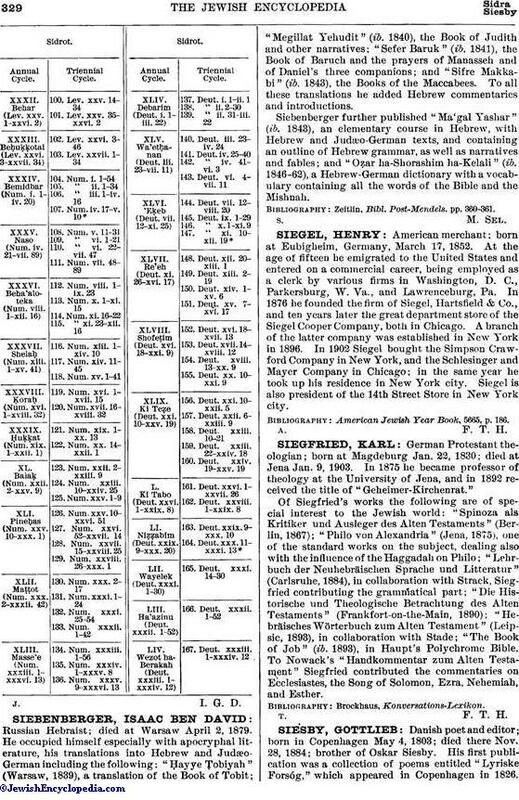 Of Siegfried's works the following are of special interest to the Jewish world: "Spinoza als Kritiker und Ausleger des Alten Testaments" (Berlin, 1867); "Philo von Alexandria" (Jena, 1875), one of the standard works on the subject, dealing also with the influence of the Haggadah on Philo; "Lehrbuch der Neuhebräischen Sprache und Litteratur" (Carlsruhe, 1884), in collaboration with Strack, Siegfried contributing the grammatical part; "Die Historische und Theologische Betrachtung des Alten Testaments" (Frankfort-on-the-Main, 1890); "Hebräisches Wörterbuch zum Alten Testament" (Leipsic, 1893), in collaboration with Stade; "The Book of Job" (ib. 1893), in Haupt's Polychrome Bible. To Nowack's "Handkommentar zum Alten Testament" Siegfried contributed the commentaries on Ecclesiastes, the Song of Solomon, Ezra, Nehemiah, and Esther.